Bartholomew Barnes once was the star quarterback at Metrobay University, leading it to four consecutive tournament championships and earning M.V.P. every year he participated. He discovered a few years later that part of he and his team’s success was due to recently manifested superpowers, apparently handed down to him genetically from his mother, secretly a member of theSuperheroine Squad years earlier. His powers had given him a significant edge over the competition in the past and he was sorely disappointed that his abilities were not something he earned himself. Unwilling to compete professionally for fear of one-sided matches, Bart retired from the sport and decided to pursue a career in health education instead. After graduating from Metrobay University, Bartholomew was offered the position of head football coach of the Metrobay Wildcats, a much-needed change considering their disastrous performance after his retirement from the game. Bart secretly followed in his mother’s footsteps, donning the costume of the lone avenger “Ramrod”. 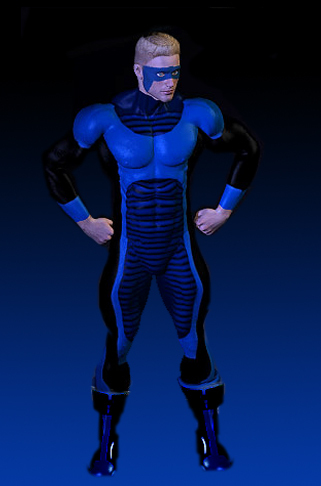 During his tenure as a superhero, he formed strong alliances with Nightengale and Pink Pussycat, as well as crossing paths with villains such as The Enchantress. Ramrod became popular with the female heroines for a decidedly different reason as well. In addition to his enhanced physique, his own personal “ramrod” was widely reported to be one of the largest in Metrobay, earning the lust of even prim and pure Pink Pussycat. Ramrod was rumored to have left town for awhile, but he recently reemerged to assist Valiant Woman in stopping a rampaging brainwashed Enormica before the two wound up captured by a mischievous Madame Mynx. Since then, the two heroes have been romantically linked by the local Metrobay tabloids, though the two adamantly deny it for the time being. Ramrod has strength roughly equivalent to that of supervillian Bronk, roughly that of a dozen men. He possesses peak, superhuman physical health which also endows him with additional virility and stamina, rumored to be a useful ability saved for the bedroom.